Signs opposing the removal of criminal and civil penalties are beginning to pop up in the city, but the group behind the effort is a mystery. 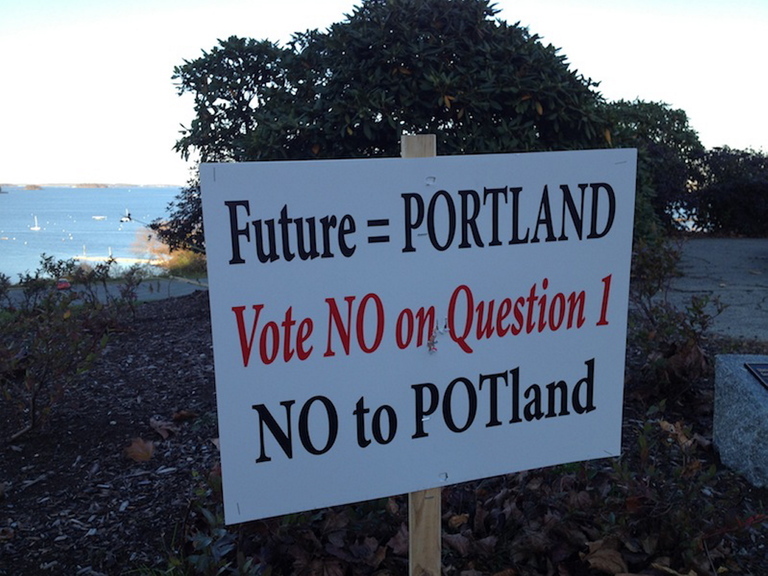 Signs opposing an effort to legalize marijuana in Portland have sprung up in the city. The small campaign signs are the first indication of any organized effort to defeat a citizens initiative that would remove all criminal and civil penalties for adults who possess as much as 2.5 ounces of marijuana in Portland. The proposal will be Question 1 on the city ballot Nov. 5. The identity of the opposition remains a mystery. The signs, some of which were posted Tuesday on the Eastern Promenade and Washington Avenue, do not say who paid for them. No group has filed paperwork at City Hall opposing the initiative, said City Clerk Kathy Jones. Any group that spends more than $5,000 for a campaign must register as a Ballot Question Committee and file campaign reports. Any campaign literature that expresses a position on a ballot question and costs more than $500 must have the name and address of the sponsor conspicuously printed on it, said Paul Lavin, assistant director of the Maine Commission on Governmental Ethics and Election Practices. 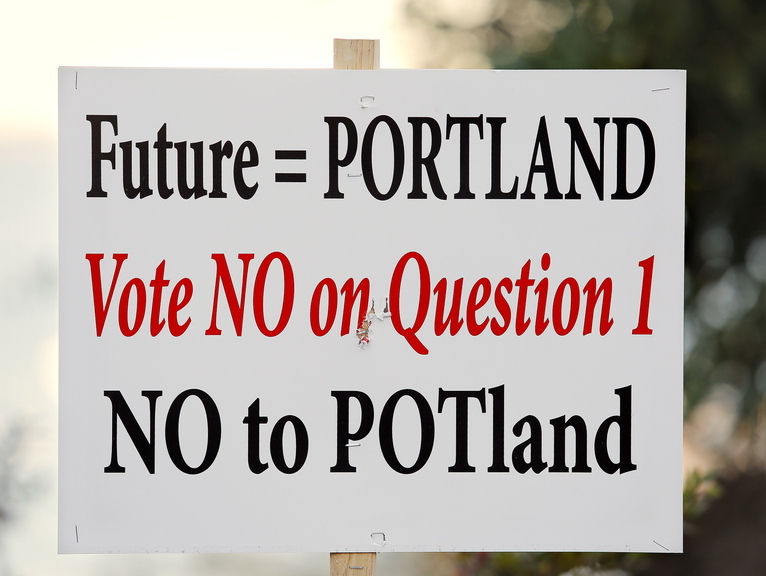 It’s not clear whether the signs opposing pot in Portland cost more than $500. Dale Rand, who owns Dale Rand Printing on Washington Avenue, said the signs were printed at his shop, but he would not say who commissioned the signs, how much they spent on them or how many were printed. “I usually do both sides, so I just like to stay out of things,” said Rand, who is something of a go-to printer for all sorts of political campaigns in Portland. The Portland Green Independents and the Washington, D.C.-based Marijuana Policy Project have been pushing for the passage of Question 1. It would prohibit recreational use of marijuana in public spaces, on school grounds or in transportation infrastructure, and would let landlords prohibit tenants from using marijuana on their property. Police would still be authorized to cooperate with federal drug agents, and marijuana use will remain illegal under state and federal law regardless of the outcome of Portland’s vote. The Marijuana Policy Project has spent nearly $14,000 on the campaign, including controversial ads on city buses and bus shelters that say marijuana is safer than alcohol. The Portland Green Independent Committee, which collected more than 2,500 signatures to put the question to voters, is leading the grass-roots campaign by conducting voter outreach, said City Councilor David Marshall, a Green Independent. Until now, there has been no organized opposition to the measure. Organizations that work to reduce drug abuse by youths, such as 21 Reasons, have expressed concern over how the debate in Portland will affect the perceived risk of marijuana, which could lead to an increase in its use. Jo Morrissey, project manager for 21 Reasons, said her group is not behind the new signs. Marshall and David Boyer, the Marijuana Policy Project’s political director for Maine, said they don’t believe the campaign signs opposing the measure will affect the outcome on Nov. 5. Both suggested that the signs will actually remind some supporters of the initiative to vote.